Lecterns are already a bad idea most of the time, and they don't make anyone look good as a speaker. But here's one more reason I dislike them: Unless you're using an adjustable lectern, a short person is at a greater disadvantage than a person of average or above-average height. An example: The presidential debate on Friday night. Did you see how high John McCain had to raise his arms for his gestures to be seen over the top of his lectern? He seemed uncomfortable having to use exaggerated arm movements (which were reenacted in the SNL skit the following night). 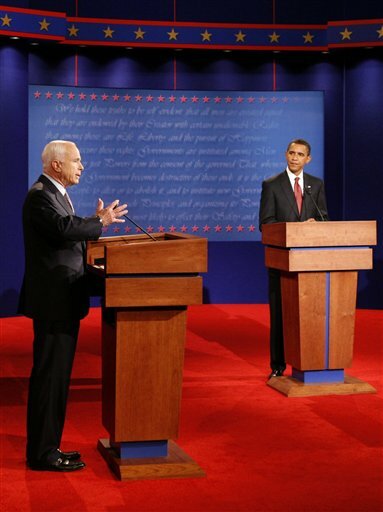 While Barack Obama, several inches taller than McCain, looked relaxed and comfortable in his movements, because the lectern was at waist level for him. See photo here. I doubt McCain would have been interested in standing on a step stool, so he was stuck trying to be seen over a too-tall lectern. I would love to see the candidates wear wireless mics and have the freedom to take a few steps away from the lecterns. How much more natural might they look and feel without the big box in front of them? How much more of a connection might they make with their audience? Totally agree with you Lisa. Unless you are delivering a long lecture where you need to refer to piles of notes, lecterns are a "no-no"